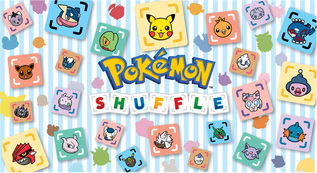 Free to play games are very popular at the moment, so it wasn’t a surprise when Nintendo and The Pokémon Company came out with Pokémon Shuffle – a free to play Pokémon title. Pokémon Shuffle has you fighting Pokémon through puzzle-type gameplay. On the bottom screen you’ll have a grid with several Pokémon faces and on the top you’ll have a Pokémon. You are given a limited number of chances to move the Pokémon faces around, and each time you match up at least three of the same kind of Pokémon, it will launch an attack on the Pokémon on the top screen. If you run out of moves, you lose the battle, but if you win the battle, you get a chance to catch it. You can catch lots of Pokémon as you go along and before each battle you choose which ones you want to bring along. As with regular Pokémon games, you then use the Pokémon with appropriate types to deal more damage to your opponents. The game incorporates the concept of Mega Evolution too and (if you have a stone to activate it) some Pokémon can Mega Evolve in battle and then matching them up will cause even more damage. Plus, Pokémon are even able to level up if you make regular use of them, which I quite like. The free to play element of the game is the fact that you have five hearts and you use one up every time you do a battle. Once a heart is gone, it will take thirty minutes for you to get another. When all the hearts are gone, you can wait to get more, or you can just spend real money to buy crystals which can be used to buy more hearts (or to buy items which will make the battles easier). You might be happy to wait, but then there are legendary Pokémon which appear for a limited time only which might be frustrating to some. Later levels are also ridiculously hard and clearly designed to make you spend money, which I did not appreciate at all. It’s a fun and very addictive game and you’ll be pleased as you battle and capture more and more of your favourite Pokémon. The minor RPG elements are appreciated and I think this is the kind of game anybody could enjoy, even if they’ve never played a Pokémon game before. Puzzle and Pokémon fans will enjoy this especially, but generally this is a fun game with a broad appeal.